Dandelion Catering is a catering service in East Anglia, based in Suffolk, which as been established for over 20 years. Their professional catering services are primarily event based and suitable for both small and large events. Currently, they offer wedding, parties and event catering; event management and resourcing; domestic catering events; commercial and business catering alongside training and cookery courses. Dandelion Catering prides itself on their exquisite food and exceptional service. Their personal style is contemporary, precise, yet delicious, local food. Dandelion wanted a brand which truly reflected their business and catering offering. Their previous branding was outdated and didn’t reflect the quality of the company. The new branding and stationery needed to generate awareness and recognition of Dandelion with clarity of offering representing the quality and expertise. Dandelion wanted the image to be distinct with the brand value to be inherent. Their stationery needed to be consistent with the brand, and to be memorable and eye catching. The aprons used by Dandelion employees at their event became one of the key recognisable features. Thump wanted to use this as a foundation for their brand, and did so by incorporating the green colour of the aprons. Colour is incredibly important in branding considering that colour increases brand recognition by 80%. The creative team at Thump put much consideration into whether this green was right choice for Dandelion. We researched into the associations of green – which is the second most favourable colour in business identity. In business, ‘green’ represents reliability, hardworking nature and confidence. This was exactly what Dandelion Catering’s brand exudes. For the Dandelion logo, Thump aimed to be clear and effective. We chose a friendly and personal script face to represent the creative side of Dandelion which is juxtaposed with a sans serif typeface underneath. 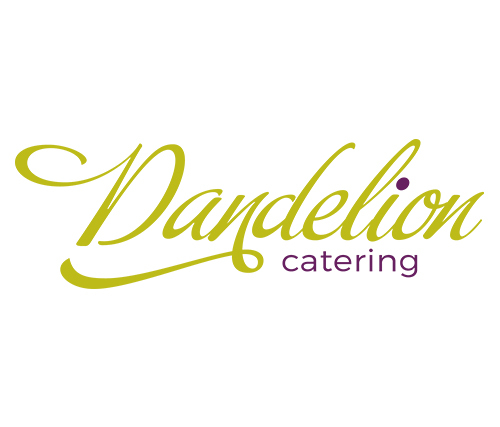 This secondary heading in the logo opens the opportunity of sub-branding, for example, between catering and events to highlight the scope of the Dandelion business offering.